Mix mustard, honey, oregano, garlic powder, red pepper and water; brush on turkey. Cover and grill turkey 4 to 6 inches from medium coals 8 to 10 minutes, brushing with mustard mixture and turning occasionally, until juice is no longer pink when centers of thickest pieces are cut. Discard any remaining mustard mixture. 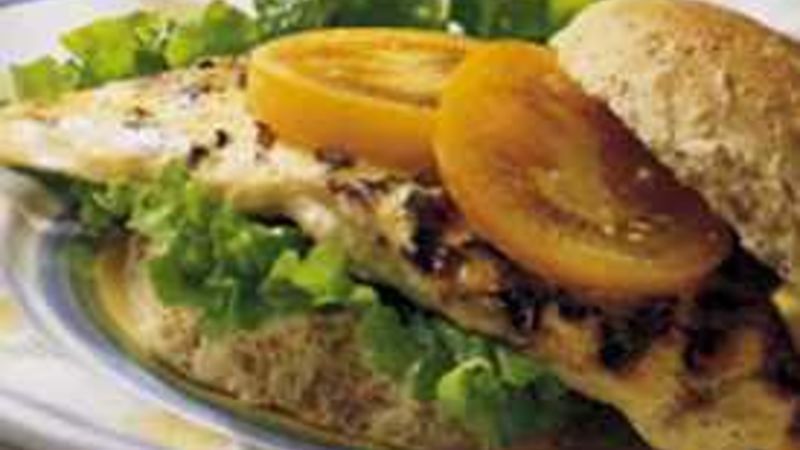 Serve turkey on buns with tomato and lettuce. Grill both sides of thick French bread slices that you’ve brushed lightly with olive oil. When they’re golden brown—it takes only a couple of minutes—you’ll have tastier bread for your sandwiches than plain buns. This is the perfect recipe for using up some mustard that’s been “hiding” in the refrigerator. Just about any variety you have—spicy brown, honey or coarse-grained—will blend with the honey, oregano and ground red pepper flavors you add.